Which Is the Bigger Threat to People in Developing Countries: Climate Change or Energy Poverty? 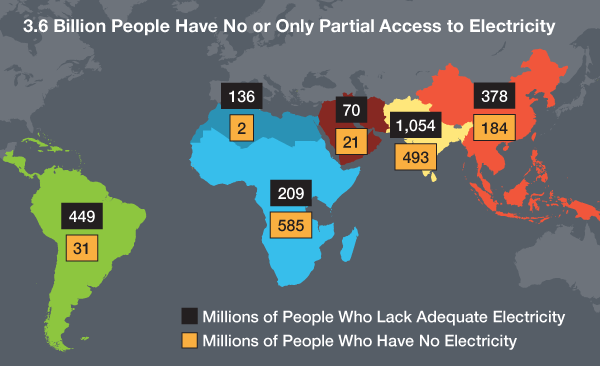 For the 1.3 billion people who have no electricity, energy poverty is indeed an existential threat. For the additional 2.3 billion people facing chronic electricity shortages, frequent blackouts, and limited hours of service, energy poverty is a decisive obstacle to development. Those 3.6 billion people need access to plentiful, reliable, affordable energy as soon as possible, and for the foreseeable future, that means carbon-based energy. Yet the pampered elites at the UN, the EU, and the White House want all countries, including India and China, where hundreds of millions still have no electricity, to make ‘politically-binding’ commitments to limit their carbon dioxide (CO2) emissions, the inescapable byproduct of carbon-energy use. Well, okay, households are not as energy-intensive as chemicals manufacturing, the engineering and machinery sector, information technology, or even textiles and financial services — all major contributors to the Indian economy. Yet without industrial growth and the expansion of energy infrastructure that supports it, millions of Indian households would be much poorer than they are today, and millions who today have electricity would still be living (or dying) in energy squalor. The abstract states that the study’s results do “not detract from the importance for developing countries to start reducing the carbon intensities of their electricity generation to ensure sustainable development and avoid future carbon lock-in.” The presser adds that “low carbon energy sources have additional benefits for developing countries and should be encouraged.” Whether Dr. Pachauri and her institute sincerely believe in the pieties of climatism or are merely mouthing those clichés as the price for getting the study published is anyone’s guess. The timing of this study — plus the presser’s gratuitous observation that “even with increased electricity use, Indian households still use less electricity than Chinese households, and less than 10% of households in the United States” — indicates that Pachauri’s main objective is political. The study is designed to provide talking points for Indian negotiators seeking the best possible deal (the least onerous CO2-reduction commitments) at the December 2014 COP 20 climate conference in Lima, Peru.